Nothing cures an after major hangover like a tournament sponsored by an insurance company. 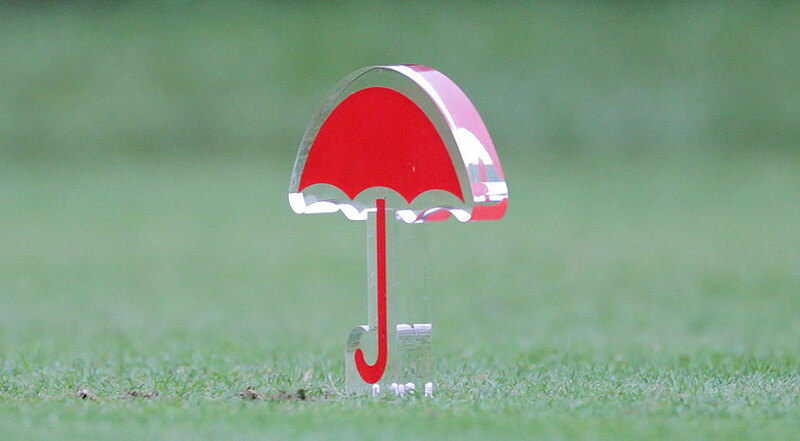 Luckily for us, we have Travelers to thank for shelling out millions of dollars they collected from healthy people to put their little umbrellas as tee markers. Wondering why I’m having you listen to a Sammy Davis, Jr. song? Keep reading! It’s becoming more and more obvious as I do these About the Sponsor sections that if a company has enough money to be the title sponsor of a PGA Tour event, they’ve probably have a really convoluted history of mergers and acquisitions that make it hard to figure out who owns what brand. This fact is very nicely summed up with the first sentence of the “History” section of the Travelers Insurance wikipedia article. A couple paragraphs down, we have this gem, which absolutely proves the point I made above. And I didn’t even have to edit wikipedia. In the 1990s, it went through a series of mergers and acquisitions. I don’t want to blab about the company’s history of mergers and acquisitions! I want to talk about something juicy, like how in 2012 they sued the NFL over them claiming need to cover the cost of the head injury lawsuits that are blanketing the NFL, and then in 2014, they sued the NFL claiming they don’t have liability over the long term effect of prescription painkillers players were given when they were playing. The two things I realized quickly when looking all these lawsuits up. 2) Finding the outcome of these lawsuits is really tough. Pretty much all of the articles google returns talk about how Travelers is suing the NFL, but none talk about what happens. The only one on the first page I could find was titled NFL Settles Players’ Concussion Lawsuit, but Insurer Involvement Uncertain. So literally, alI got is that there are still ongoing legal issues with Travelers and the NFL. That, or they settled unceremoniously outside of court. With the amount of money these insurance companies seem to spend on lawyers and golf tournaments makes me wonder how much actually goes to paying off insurance claims. Not a political question, actually curious where all the money is going. If anyone out there has any ideas, let us know. I didn’t expect much when I looked back at the past tournament results / names. I knew this was another tournament that used to have Hartford (the city the course is near) in the title, but lost out to a big corporate sponsor when purse sizes went up. But apparently this tournament started off as the “Insurance City Open”! Ted Kroll won and won a first prize of $2,400, which in 1952 was a decent amount. Only in 1967 was Insurance City dropped from the title, and Hartford was added. Kind of neat, check out the newspaper article from 1952 about the tournament here. Also of note is the involvement of Sammy Davis, Jr. in the tournament’s history. He was a frequent player in the pro am of the event, and even managed to slap his name in the title of the event for a solid 15 years back in the 70s and 80s — known as the Sammy Davis Jr.-Greater Hartford Open, and the Canon Sammy Davis Jr.-Greater Hartford Open (Canon being the camera company, not that SDJ added another name at the beginning). TPC River Highlands. I’m not kidding, we have another TPC course. Maybe the PGA Tour plays most of its tournaments on TPC courses, or maybe it’s just that I never realized until I was writing about the courses every week. Either way, it’s kind ridiculous how often I’m typing TPC in this section of the preview. Founded in 1928, the club was bought by the PGA tour in 1984 when they brought in Pete Dye to remake the course into a TPC. At par 70, 6842 yards, the course is, well, pretty easy. The course record of 60 was set a few years ago in 2011 by Patrick Cantlay (as an amateur), and the winning scores are well under par. And hey! The course even has a twitter account. Looks like they’ve only been around since May. I feel like it would be really tough to run a twitter account for a golf course. Not really much changes from day to day. Probably have to get creative with the hashtags, just like these people are doing. 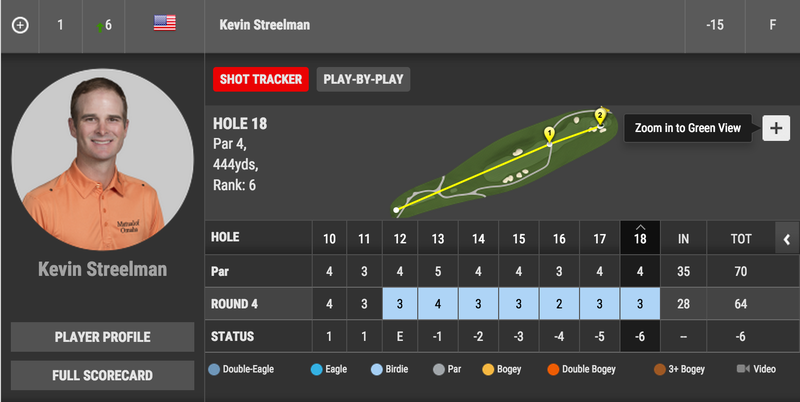 Kevin Streelman shoots a pair of 64s on the weekend to win by one over Sergio and KJ Choi. Oh yeah, know how he shot that Sunday 64? By being +1 through 11 holes and then birdieing the last 7. Just look at that scorecard. That’s the smile of a dude who birdied the last 7 holes. Green Grass — No more putting on broccoli or cauliflower, we get bentgrass greens this week! And bentgrass fairways! And bluegrass rough! Don’t let the “blue” in bluegrass fool you, this stuff is all green baby. 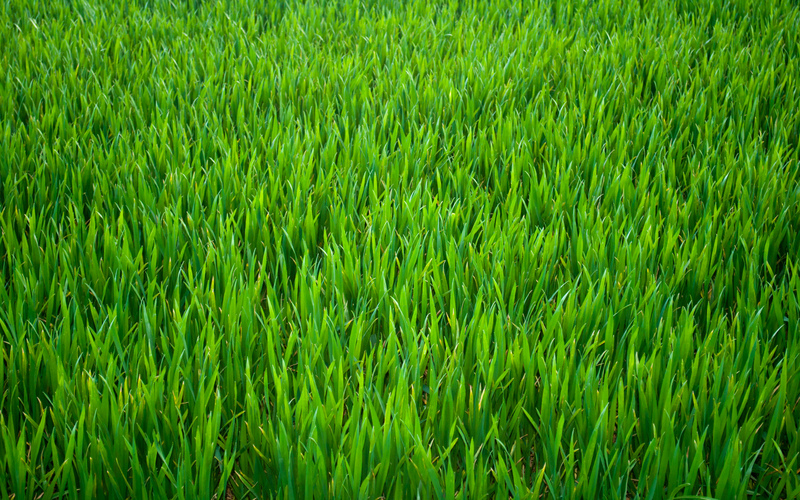 Here’s a picture of some grass so you remember what green grass looks like. Don’t want you blinded when you tune into coverage on Thursday. Gotta ease back to it. Red Numbers — This isn’t the US Open, and the PGA Tour actually likes it when the guys shoot low numbers. Combined with the easyish course and you’re looking at bunches of players under par. In the past 10 years, the worst winning score was –12. Lowest winning score was back in 2009 when Kenny Perry was –22. And in my opinion, it’s a little more fun to need birdies to win, rather than pars. Red umbrellas everywhere — Just like the color of the scores, Travelers little red umbrellas are scattered everywhere around the course, even the tee markers. Pretty sure that tee market can’t get wet ever. Players having to answer questions about switching mentalities — Granted, this won’t affect too many players, but for those who have to travel way across the country after the Open will run into a completely different course three time zones over, making the switch isn’t the easiest. After grinding for 7 days (practice rounds included) on a links style course with all this rollout, these players need to switch back to a “normal” styled course. Sure, these are professionals whose jobs it is to play golf everywhere, but after a week of low running shots can mess up a swing when it comes to switching to a high ball flight again.